How to unlock EE / Orange iPhones 4, 4S, 5, 6, 6+ etc…? All devices sold by EE are locked to EE. This means they’ll only work with an EE SIM card – they won’t work with another network’s SIM card. We can solve your problem. Your phone will be unlocked and ready to use with any network provider. Vodafone, EE, Orange, T-Mobile, O2, Tesco, GiffGaff phone unlocking service. Fast and permanent. Just need IMEI number. Find us, if you want your EE / Orange phone unlocked! 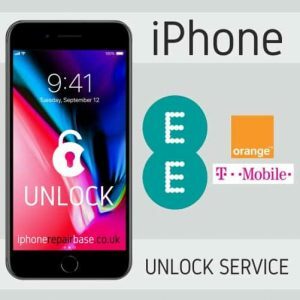 Official factory unlock for iPhone on EE, Orange, T-mobile, Virgin UK only. Fast and permanent. Just need IMEI.